Bobby Poppell, 80, passed away on Sunday, December 29, 2013 at Wayne Memorial Hospital. Bobby was born on September 5, 1933 in Brentwood, Georgia to the late Harry and Alma Moody Poppell. As a lifelong Wayne County resident he attended Odum High School and was a member of Odum Baptist Church. Bobby believed in honest hard work. He worked forty-four years with Poppell Brothers Timber Company, owned by he and his brother, as a stump producer for Hercules eventually retiring in 1995. Bobby enjoyed farming and raising cattle. He also raised and raced horses for many years. Bobby loved his family and worked tirelessly to provide for them. 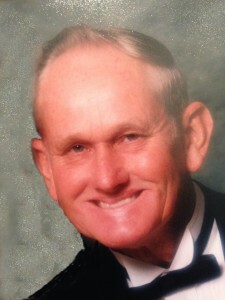 Later in life, he cherished the time spent with his grandchildren who were always a source of pride for him. In addition to his parents, he was preceded in death by his two sisters, Elouise Blanton and Lucy Taylor and one brother, Edwin Poppell. Survivors include his wife of fifty-three years, Evonne L. Poppell of Odum; a son and daughter-in-law, Robby and Diana Poppell of Odum; a daughter and son-in-law, Jan P. and Mike Dollar of Claxton; one sister, Betty Willis of Blakely, Georgia; one brother and sister-in-law, Raynell and Cleo Poppell of Odum; five grandchildren, Rob Poppell, Blake Poppell, Michala Dollar, Shelby Dollar and Alyssa Dollar. A host of nieces and nephews also survive. Funeral services will be at 2:00 p.m. on Wednesday, January 1, 2014 at Howard & Jones Funeral Home with Reverend Carl Ledbetter officiating. The family will receive friends one hour prior to the services at the funeral home. Active pallbearers will be Len Lewis, Derek Landon, Don Landon, Mike Blocker, Ricky Blanton, Steve Tupper and Jeff Willis. Honorary pallbearers will be David Long, Glynn and Lindsey Wynn, Howard Jernigan, Danny Jones, Glenn Aspinwall, Hollis Ellis, Bruce Woodard, Kenny Poppell, Sr., R.L. Poppell, Leonard Poppell, Elbert Poppell, James Carter and Tony Lastinger.